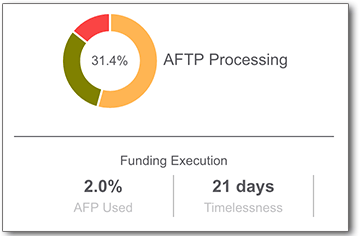 The Aviation Status dashboard shows AFTP usage in real time. Determine costs committed, number of AFTP utilized and contrast those numbers with the AFTP Annual Funding Program. 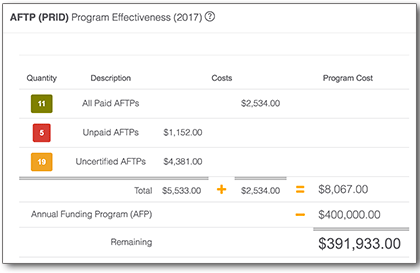 With real time data of how many AFTPs are being used, estimation of program funding becomes very straightforward. 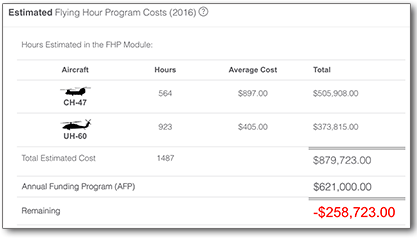 When coupled with your organization's ULLS-A data, the organizations to-date Flying Hour Program costs can easily be calculated. This tool provides the Commander with an unprecedented perspective into organizational resource efficiencies. Projection of remaining fuel / flight hour costs can for the first time be realized accurately. This process can also satisfy management controls to help determine committed funding. The ability to realize how efficient and accurate your organization's fiscal operations could never be easier. From calculations of AFTP certification and pay timeliness to understanding the committed dollar amount of your programs are updated in realtime with the Aviation Status dashboard.